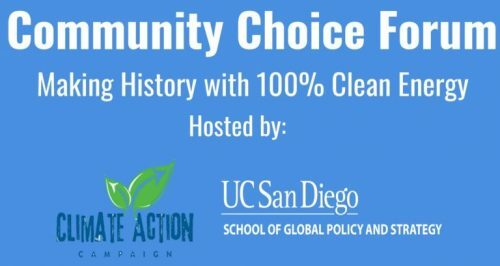 Clean Coalition Executive Director, Craig Lewis, sat on a panel and presented on our strategic Solar Siting Survey work with NREL and the City of San Diego at the Community Choice Forum, which took place September 7, 2018 at the University of California San Diego. The Clean Coalition was also a partner organization for this event. Six communities in San Diego County have committed to 100% clean energy by 2035, and all six have identified Community Choice as a tried-and-true pathway to succeed. At this event, an elite mix of state and local government officials, government staff, community choice practitioners, industry experts, business leaders, and community advocates discussed the local and state landscape, as well as the benefits, challenges, and opportunities of Community Choice.